Do you wish that more people understood the importance of providing free treatment for cleft lips and palates in under-served areas of the world? Then this program is for you! GoGo Smile Ambassadors raise funds on behalf of Alliance for Smiles and create a brighter future for children and families. Ambassadors help spread the word about our work through social media and email. Or we can set up a page for you. Just email yulla@allianceforsmiles.org or call us at (415) 647-4481. Setting up a GoGo Smile Ambassador page takes less than 15 minutes and can be done on your schedule. We help with all of the technical aspects and provide guidance on communication. The most important part is an eagerness to explain why this work is important to you and a willingness to share that with friends and family online. Your participation will make a huge difference in our work! Your fundraising goal. You can change your goal at any time. The average fundraiser is $1,000. This will provide a complete and transformative cleft operation to one child. Let us know if you have any questions about the GoGo Smile Ambassador program! Facebook gives users the ability to host fundraisers for nonprofit organizations. 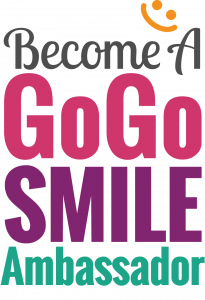 This is a great way to support Alliance for Smiles and be part of our GoGo Smile Ambassador community. Please consider hosting a Facebook Fundraiser. Facebook charges no fees for donations to nonprofits. Setup and participation takes less than ten minutes. If you’re interested in participating, please follow the steps below. If you have any questions, please email yulla@allianceforsmiles.org or call us at (415) 647-4481. We’re happy to help with any technical aspects and provide guidance on communication. Click the “+ Raise Money” button on the right side of the page. A window will pop up with details about creating a fundraiser. Click the “Get Started” button. Ensure that “Alliance for Smiles” is selected as the charity you are raising money for. Create a fundraising goal and date the campaign ends and click “Next”. Fundraising campaigns usually last 2-4 weeks. Name your fundraiser and explain why you’re raising money. We encourage you to personalize this part of the page and explain to individuals why you’re supporting Alliance for Smiles! Click “Next” when you’re done. Add a photo. You can add your own photo or select one of the photos provided. Click “Create”, and you’re all set! Share the link on Facebook so that friends know you’re participating! Again, if you need help with anything, please let us know. Thank you for your support!